“Fierce, smart and unapologetic.” That’s not how the Principal Secretary to the Prime Minister, and his PMO male colleagues, like female MPs to be. Read the tweet below. What does it mean? 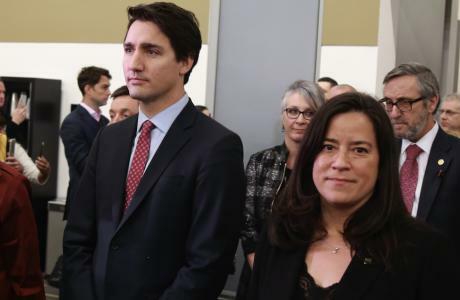 It means the Liberal caucus – with the sad exception of the new Minister of Justice and his Parliamentary Secretary, both busily currying favour with unelected PMO types – are pissed off. It means that Liberal MPs believe JWR is being blamed for PMO’s mistakes. And they don’t like it. I’m hearing from elected Liberals – and I’m hearing they are very, very unhappy with Trudeau’s PMO. If nothing else, this situation has only raised JWR’s standing in my mind, and she was already a highlight on the federal scene, to me. I particularly like Philpott and Freeland too. I will be interested to see what sides people end up taking, should it come to that. It will be something else if the Libs manage to lose the next election — the alternatives might as well be potatoes. I’m anything but a fan of MP Celina, who IMO has been somewhat of a race baiter. But credit where credit is due, good on her! Nice to seem someone with the spine to not just fall in line like the rest of the robots. She just earned a lot of respect from me. The anonymous smearing of JWR being orchestrated by Gerry Butts is unfathomably slimy, sickens me actually. 2) Blair takes over as public face of irregular migration issue from Hussen.